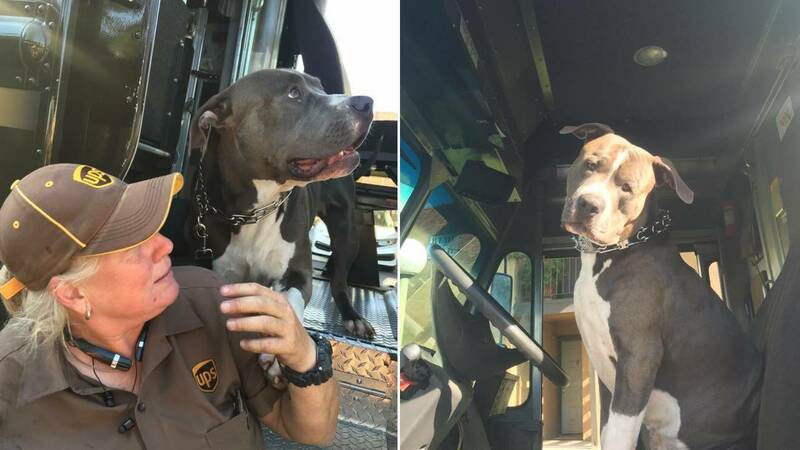 RANCHO CUCAMONGA, California - A kindhearted UPS Diver adopted a friendly dog that she met along her route after his owner passed away. Newhouser said Leo would hop in her truck when she drove into his owner, Tina’s, condo complex. So when Newhouser found out that Tina had passed away, she wanted to step up and help. “When I found out that Tina had passed away, I was in shock and disbelief,” Newhouser told InsideEdition.com. “I got to know Tina through Leo. As is the case with many of my customers that I have become friends with, I generally will know the dog’s name before their name." Tina’s son Cannon, who've adopted Leo when he was just a puppy, was away and Newhouser didn’t want Tina’s mom to have to worry about Leo. “I let him know that I would take care of Leo until he returned. They had enough to deal with,” Newhouser said. “He would whine just before falling asleep at night. I really do feel that he was missing Tina,” Newhouser said. Eventually, however, Leo began to bond with one of Newhouser’s other dogs, Moose, and that helped him a great deal. Newhouser said Tina’s family eventually agreed it’d be best for Leo to remain with her permanently as he had already bonded with Newhouser’s five other dogs and seemed happy.